Heart rate variability (HRV) is often used as a measure of the sympathetic nervous system. One way to quantify HRV is by calculating the Inter-beat interval (IBI), also referred to as the RR-interval. 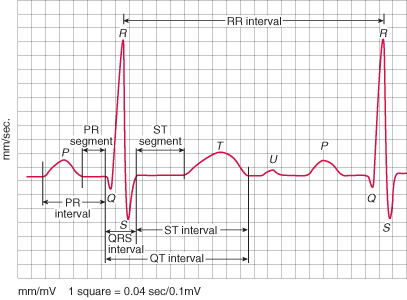 The RR-interval refers to the time between two R-peak of a traditional ECG heart-beat waveform (see Figure 1). However, in a review article by Shaffer, McCraty and Zerr (2014) they refer to normal-to-normal (NN) intervals instead. This extends to the statistical measures of the RR intervals, such as SDRR, pRR50 (Urooj, Gupta, Sp & Tandon, 2014), i.e., SDNN and pNN50, respectively (Shafer et al., 2014). What is the difference between RR-intervals and the NN-intervals? Shaffer, F., McCraty, R., & Zerr, C. L. (2014). A healthy heart is not a metronome: an integrative review of the heart's anatomy and heart rate variability. Frontiers in psychology, 5, 1040. Urooj, M., Gupta, S., Sp, V., & Tandon, M. (2014). REFERENCE RANGE OF HEART RATE VARIABILITY AND VALIDATION IN SUBJECTS WITH ASYMPTOMATIC ELEVATED LIVER FUNCTION ENZYMES. International Journal of Current Pharmaceutical Research, 6(4), 49-52. The difference is rather simple. NN-intervals refer to the intervals between normal R-peaks. During a measurement, artifacts may arise due to arrhythmic events or faulty sensors, for example (Citi, Brown & Barbieri, 2012). This may lead to abnormal R-peaks, which may in turn distort the statistical measures. To ensure reliable and valid data, only normal R-peaks are selected. Alternatively, the abnormal R-peaks can be corrected. In practice, however, RR-intervals and NN-intervals are synonymous (Tarvainen, 2014; Wiki). The use of "NN-intervals" is merely used to emphasize that normal R-peaks were used. Citi, L., Brown, E. N., & Barbieri, R. (2012). A real-time automated point-process method for the detection and correction of erroneous and ectopic heartbeats. IEEE transactions on biomedical engineering, 59(10), 2828-2837. Tarvainen, M.P. (2014). Kubios HRV version 2.2: User's Guide. Not the answer you're looking for? Browse other questions tagged methodology data workload heart-rate-variability ecg or ask your own question. What is the difference between mathematical psychology and quantitative psychology?